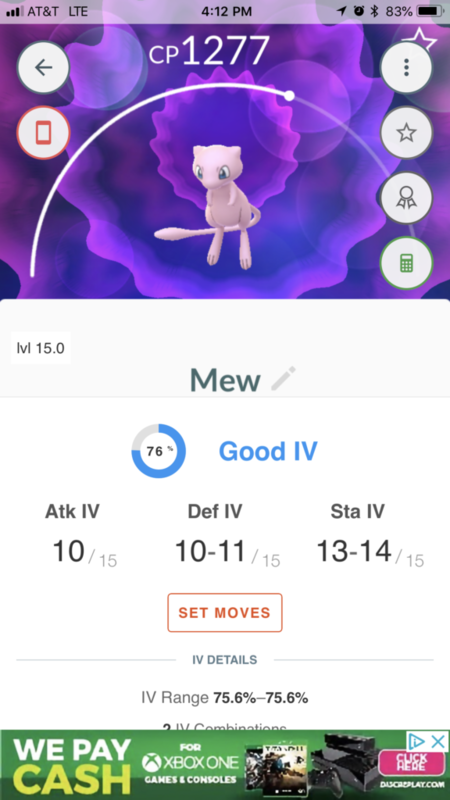 The Latest Pokémon GO Community Day and Something Mew! 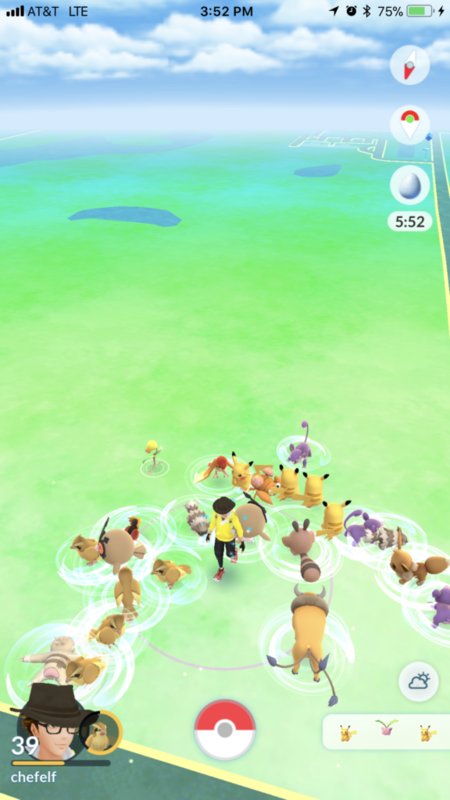 Yesterday’s most recent Pokémon GO Community Day was another hit, at least in my area. There were hundreds of people that turned out downtown to try to find shiny Bulbasaur. 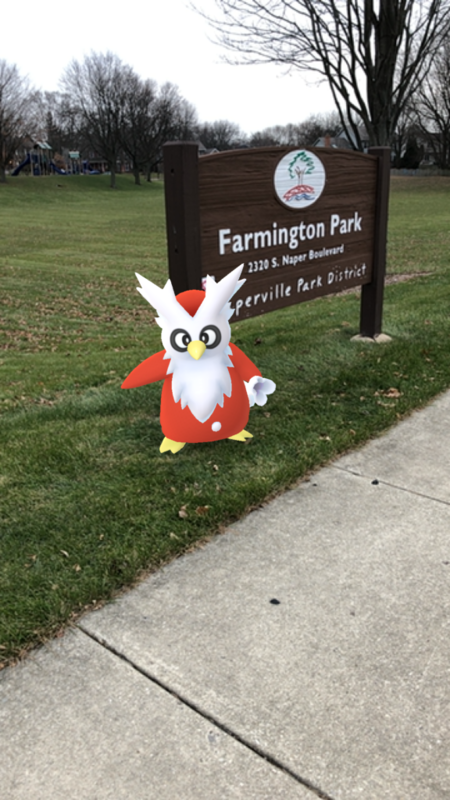 I will admit that I didn’t hunt the entire time as I got a good number of shinies fairly quickly and the cold temperatures were taking a toll on my fingers. 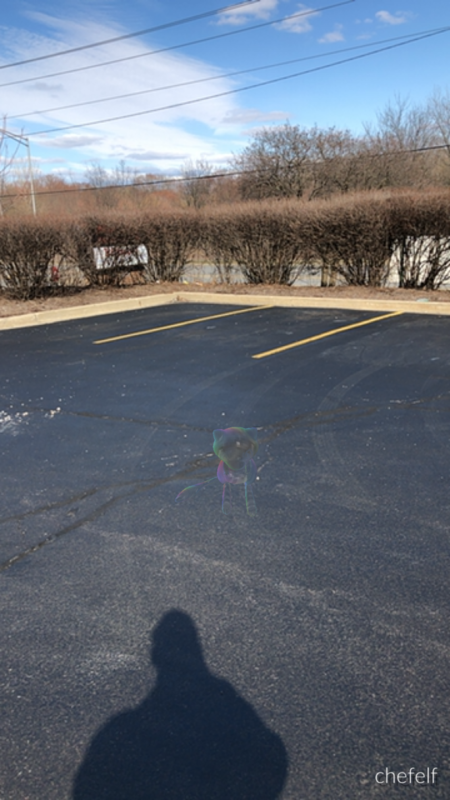 Community Day has been pretty fun now that we are getting ample warning about when they will occur. 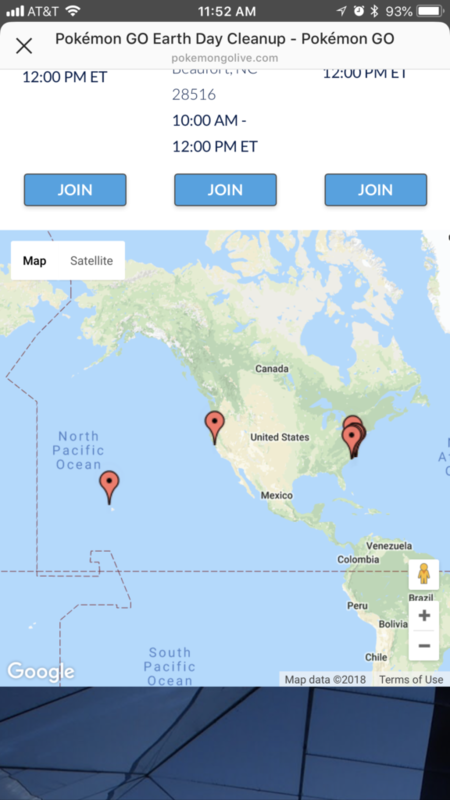 I must admit that I’m looking forward to April’s Community Day as the chances of weather being more favorable in my part of the world is much higher. Bulbasaur wasn’t quite as exciting as Dratini as it’s not as relevant or rare a Pokémon but it was still a lot of fun. The main issue was that in the bright sunlight I caught multiple shiny Bulbasaur without even being aware they were shiny. 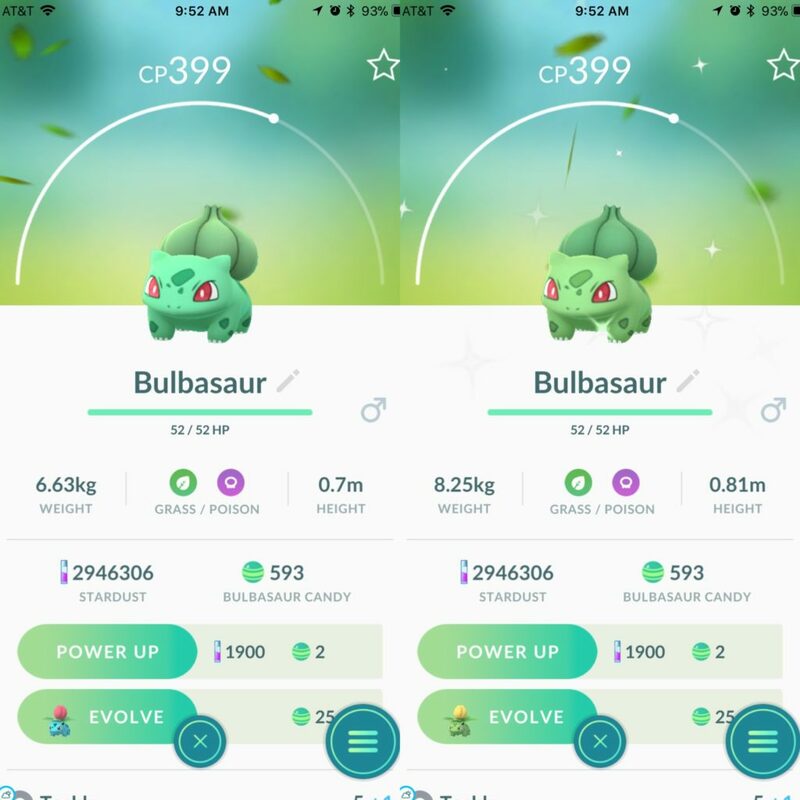 In the light I couldn’t see the sparkles and the difference between shiny and normal Bulbasaur is almost imperceptible without a frame of reference (the shiny one is on the right). 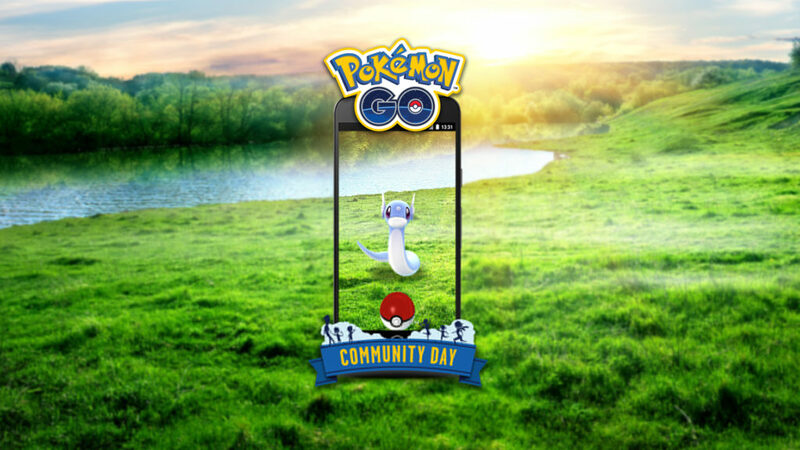 I had intended to write a simple recap of Community Day before the biggest news in a long time dropped this morning. 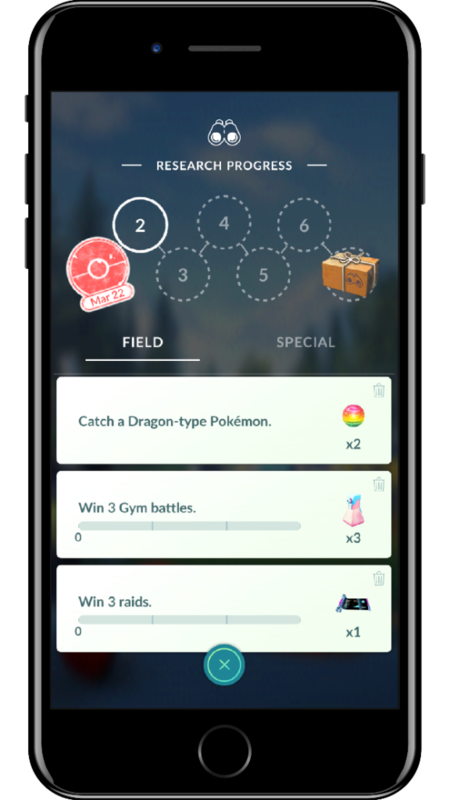 Quests are coming to Pokémon GO! This is something I’ve been wanting for a long, long time and it looks like in a week’s time they will finally be here. Better yet, this first quest (or research) looks like it will be revealing one of the few holes in my Gen 1 Pokédex, Mew. 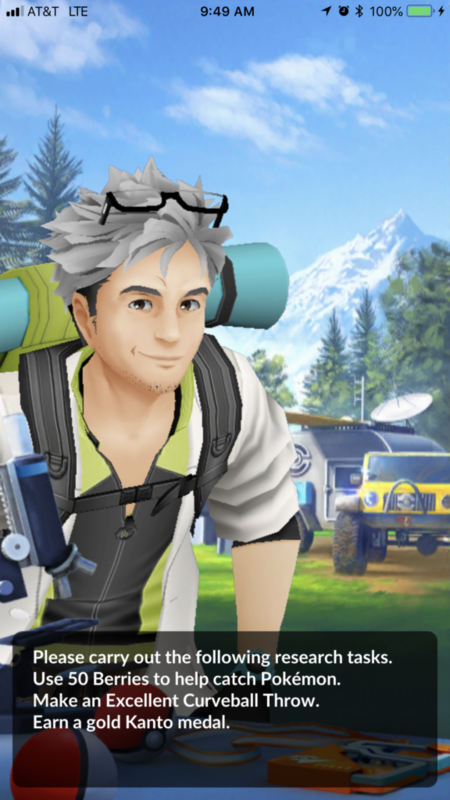 After not having seen Professor Oak since the first day I played the game he will apparently be making a return to tell us what we need to do to help him in his research. It will be nice to see him again rather than repeatedly transferring Venonats to him. 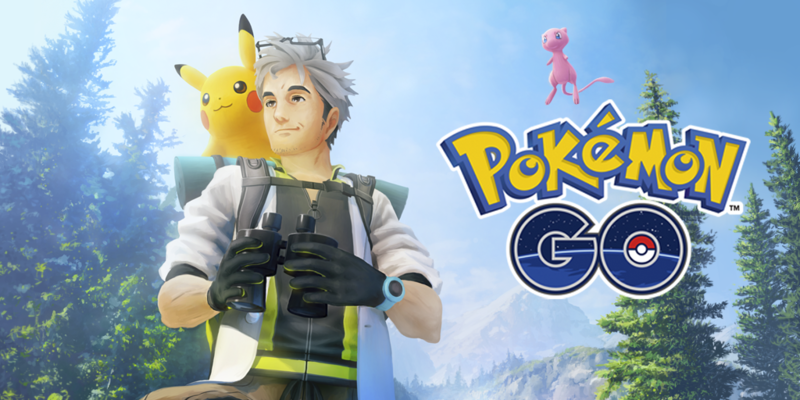 It’s a little unclear exactly how they’ll work but the full details are available here on the official Pokémon GO website. I sincerely hope the quest items to unlock Mew are a bit more challenging than that. I’m sure this is just an example or as indicated in the pic above perhaps the first level (of eight) that you need to do to get Mew. There is also another screen showed which displays rewards for doing the specific items listed. There appears to be some sort of stamp reward but it’s still unclear how this works or how you get them. 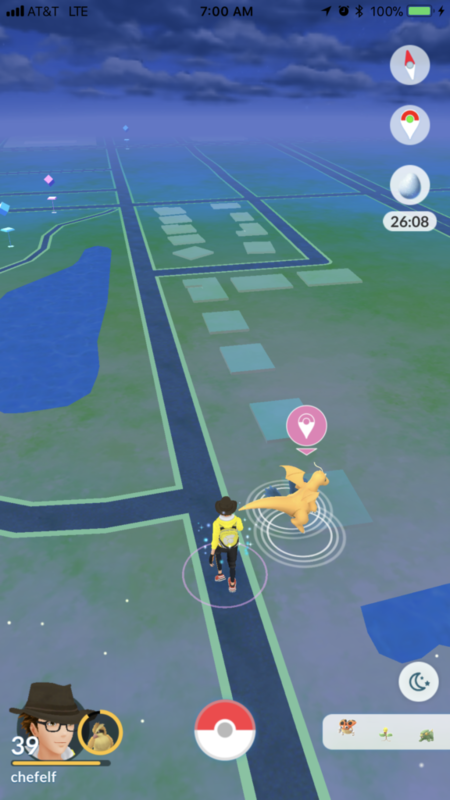 This screenshot shows a potential update to the game with the research icon replacing weather which has been moved to the top right corner of the screen. To me this is the most exciting update to the game since the Buddy System was released, even though that system doesn’t have nearly the impact now that it did upon release. To me, this is how Mewtwo should have been done. I don’t care how hard the quest is or how long it takes, I’m so much more excited to play the game working toward a stretch goal than I am doing random raids hoping to win the EX Raid Pass lottery. Even eventually getting the pass doesn’t mean I’d even be able to attend the raid if I happen to have an obligation that day. I’m very much looking forward to March 30th to get my first glimpse of what this update looks like and have a new reason to play the game. I’d been hearing about Fortnite for some time now. Given that my time for console gaming is exceptionally limited I’d been largely ignoring it. 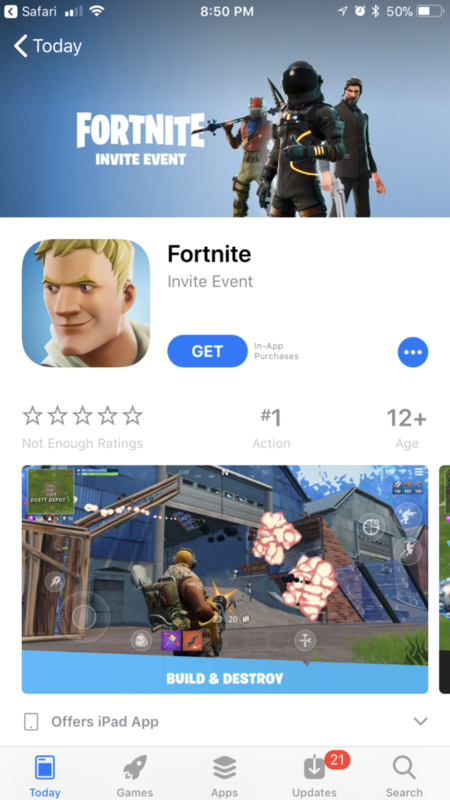 That was until it was announced that it was being put out as a mobile app by invite only. Figuring I’d be very low on the list for an invite I signed up only to receive my invite later that same day. I’d played a lot of Halo as a multiplayer game in LAN parties then later Halo 2 online. The age of these games give you an indication of how old my multiplayer shooter experience is. 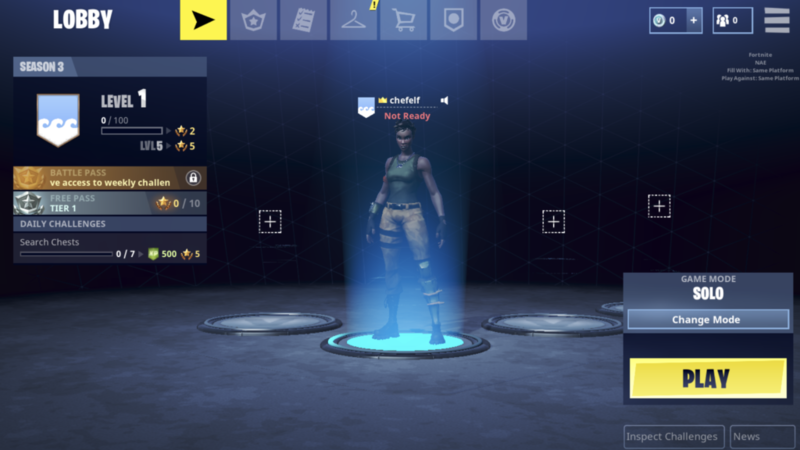 Fortnite on mobile is a very fun experience. The controls are much better than I would have thought though I would really like to give this game a shot with a traditional controller. I know a mouse/keyboard combination is probably even better but I’m a controller guy (i.e. not a serious gamer). I’ve figured out the basic gist of the game but there’s still a lot I’m in the dark about. I’m sure a lot of things I’m confused about could easily be settled by watching a tutorial video but what fun would that be? If there’s a way to customize your character I’m not smart enough to figure it out. Oddly it seems to just give me a randomly generated character with each new game. 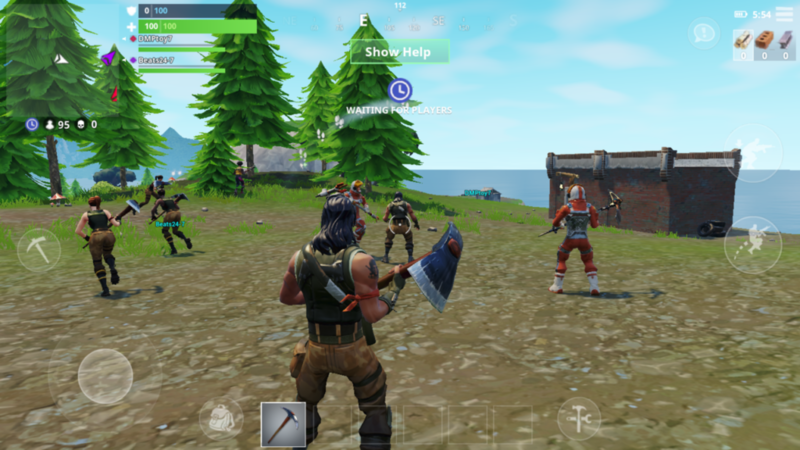 When you’re done in the lobby you are thrown into some sort of strange melee where everyone is jumping around and hitting each other but no one seems to die. At first I thought this was the game and couldn’t figure out why nothing was happening. After that you’re transported to a blue bus floating above an island on a balloon. 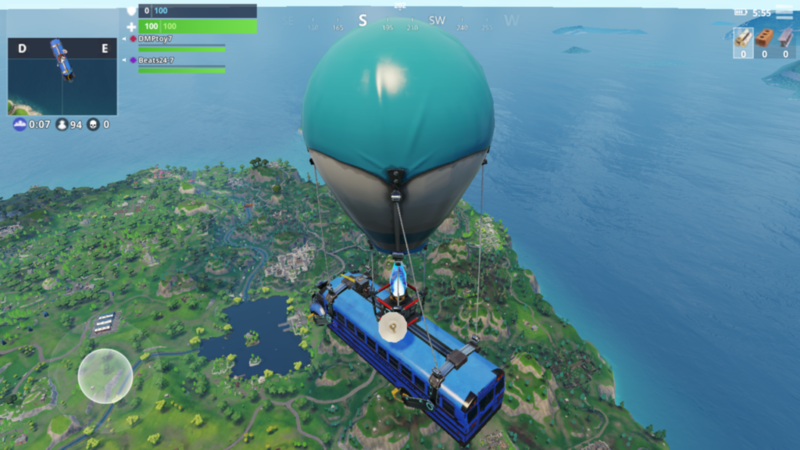 After a while you’re able to jump out of the bus and skydive to the island below. Your default weapon is a pick axe which you can use to break apart almost anything and get bits of steel, wood, or presumably other materials. There is undoubtedly something you can do with these materials but that is beyond me at this point. You can also find weapons which you can then use to attack other players. There are names hovering in the air giving you the names of other players. After a bit I started hunting down these players and emptying all my ammunition into them. It turns out these are members of your own team. Luckily you can’t seem to kill them, you just watch as they stand there looking at you wondering why you are so bad at his game. There’s also some storm that is always imminent. In one of my games I survived long enough to see the storm in action. I still don’t know what purpose the storm serves or why it happens but I’m sure it must be fairly significant to game play. 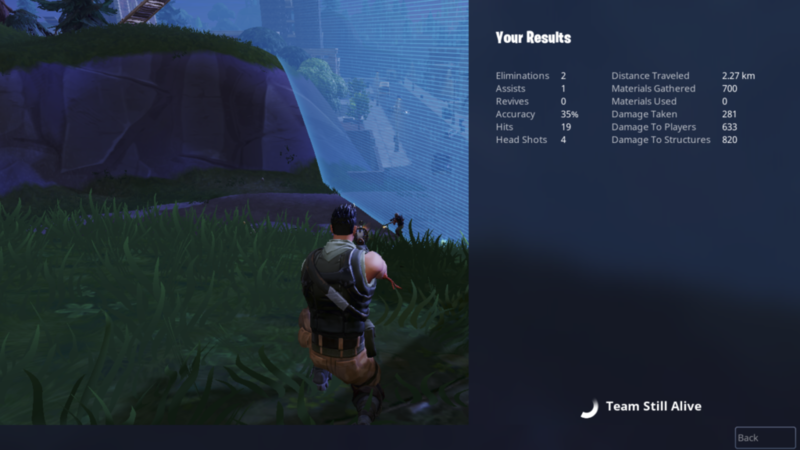 In one game so far I was able to hole up in a mine and actually take down several enemy players who do not have their names displayed and are much harder to spot. 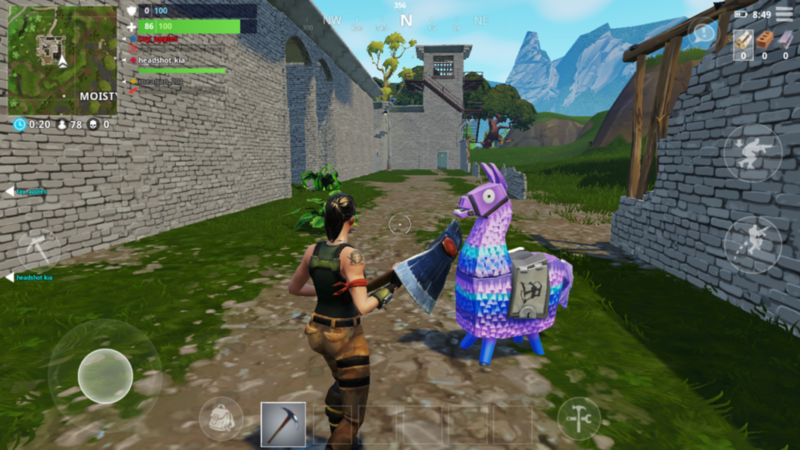 In yet another game I stumbled upon a llama pinata, something that I know is an extremely rare item in the game. I was excited even though I didn’t know hat 75% of the items did and I knew I’d be dead within a minute anyway. With all of this being said I’m having a lot of fun playing this game. I’m thinking I will eventually do some research to answer my questions and, most likely, make me much better at this game. My teammates will likely appreciate this. 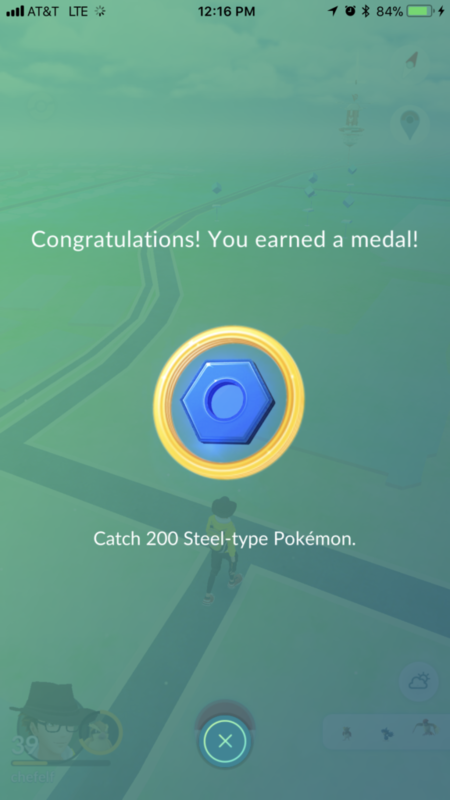 The latest Pokémon GO special event has just concluded. I had carefully calculated my XP gains so that I would reach level 40 late this morning. 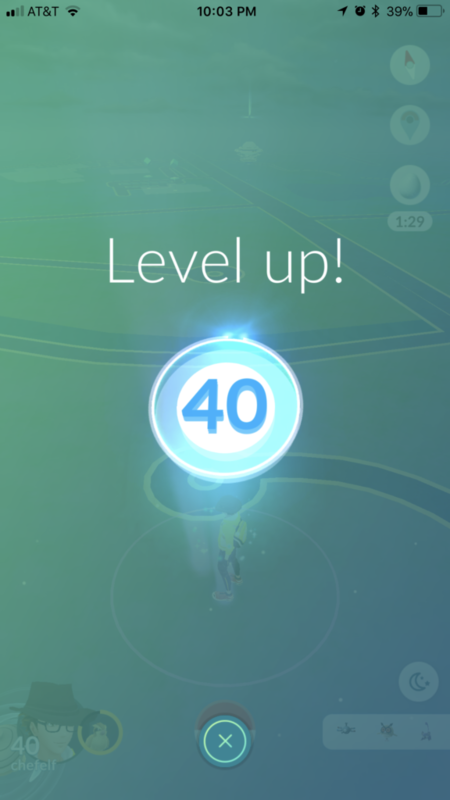 Due to a miscalculation in my grinding schedule I hit level 40 late last night instead, unexpectedly after a binge evolution session gained me slightly more XP than I had planned on. Events continue to be the only time I seriously play the game. The rest of the time I am merely catching a few Pokémon and spinning a few stops to keep my streaks alive. If Niantic were a little quicker in implementing quests I may be more apt to fire up the app during regular play. When Pokémon GO first came out there was a sight with a calculator to estimate when you would reach level 40. My estimation was mid 2019. My grinding sessions over the past nearly two years must have really paid off. 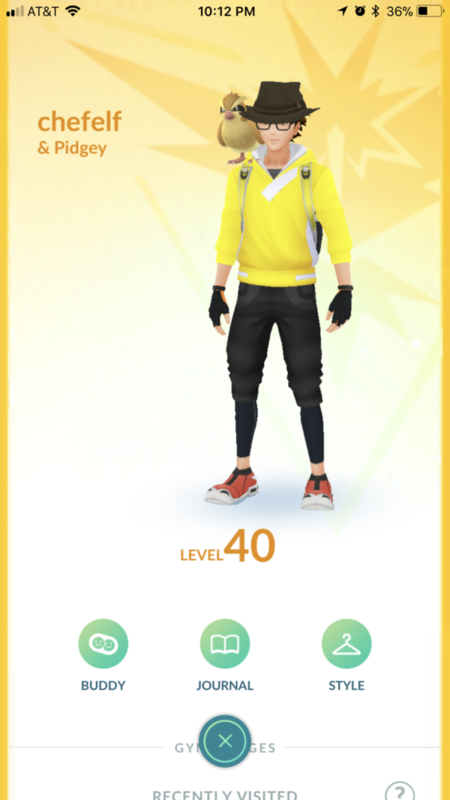 There are people who hit level 40 mere months after the game was released. It has been a long road but it’s pretty satisfying to finally be at he final level. I am regularly in raid groups with people I see out all the time that are still in the mid 30s so knowing how much they play underscores the achievement of hitting level 40. 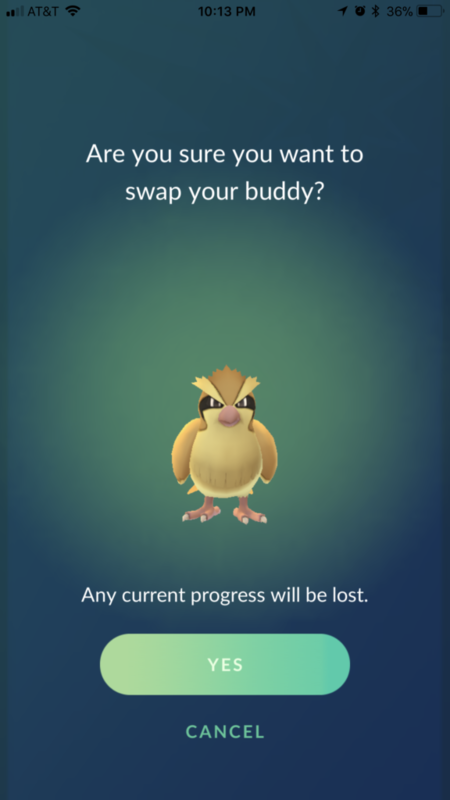 I even finally retired my buddy, the Pidgey who had been my companion through all of level 39. The need for Pidgey candy for grinding is now taking a backseat to finishing off my Pokédex. I run into a lot of people who take months off then come back. I guess the key is that I have played the game every day since it was released in July of 2016. Sometimes it’s for ten minutes. Today, for example, I have barely played as I take a break from the week long grind to complete level 39. Other days, like yesterday, I’m opening the app every ten or fifteen minutes to get some valuable XP. 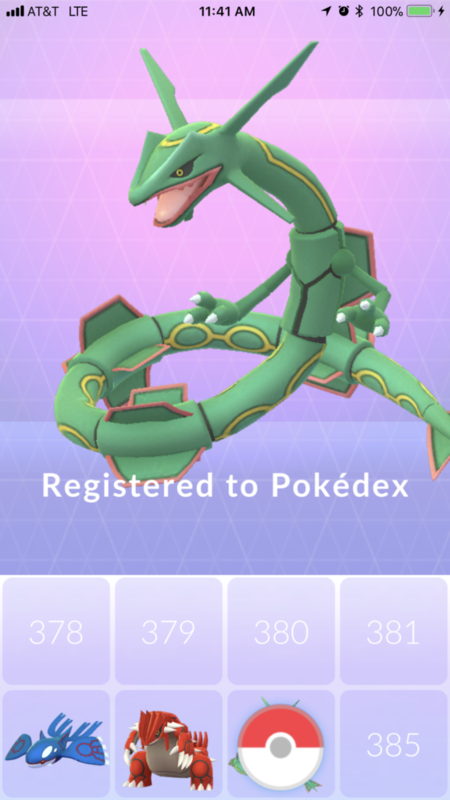 On Monday, only a few weeks before he was about to leave the game, I finally caught my first Rayquaza. It was a little more difficult than normal given that everyone’s pretty sick of Rauquaza after a week. Luckily there were some people grinding that were just there for the XP. On Wednesday, my last full day of level 39, I randomly encountered my first ever Dragonite in the wild. I nearly got him with my GO plus as I wasn’t really paying attention at the time. 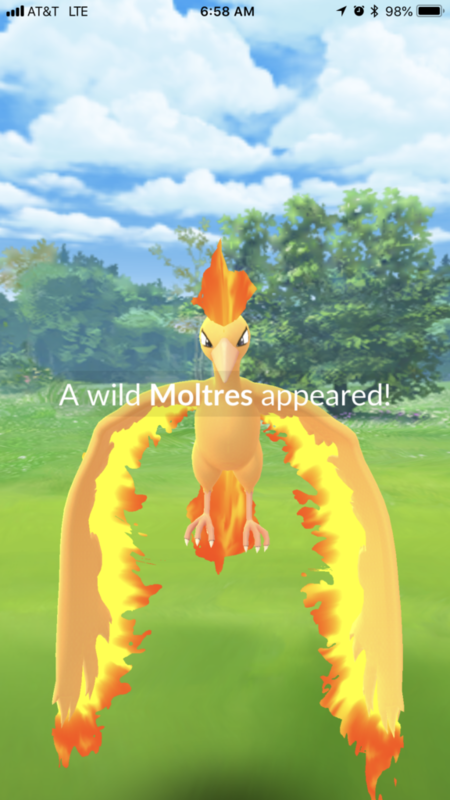 I’ve never used a tracker to hunt down Dragonites and I had thought I’d never run into one. I remember the odds of this were calculated somewhere around 1:1,000,000 so I was pretty psyched, even though I’ve evolved more than enough for my needs. On top of running into it he ended up having very good IVs. Even if he was 32 CP I would have kept him, excited to finally run into a wild one for the first time. After hoping we’d get a bit of a legendary break it was announced yesterday that Lugia was coming back. This wasn’t terribly exciting. I have plenty so I was excited to have a break from all this raiding. 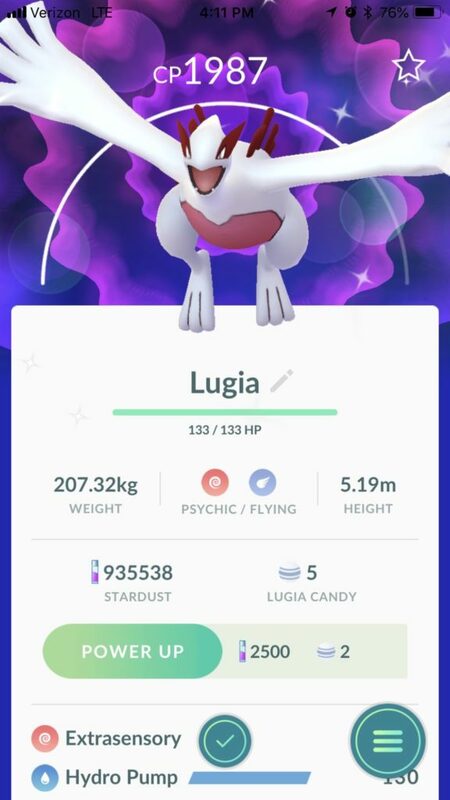 Then came the news today that there will be shiny Lugia. Whether they are all shiny I am not sure at this point but it looks like I will not be getting a break after all. 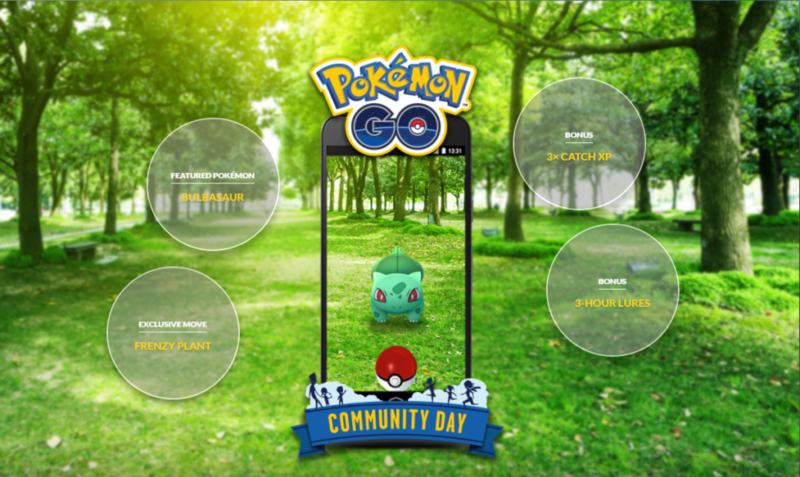 Saturday marked Pokémon GO‘s first Community Day. 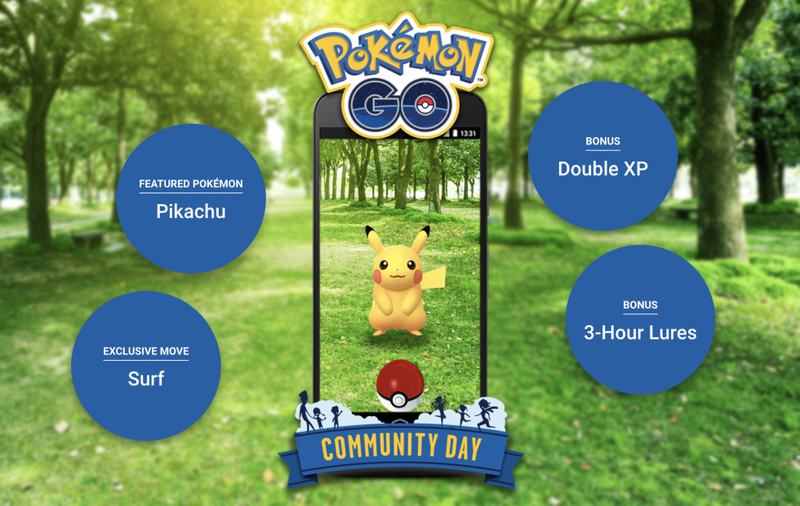 Community Day was announced more ahead of time than a normal Pokémon GO event, however, it only lasted three hours. This was a bit of a bummer for those of us that were working between 1:00 PM and 4:00 PM CST. This seems to be something they’ve already remedied for the next event giving us over a month to plan for February. I was able to play for about 20 minutes on my way home from work, largely while I was getting gas. Luckily for me this particular gas station is always a hot spot despite being sort of in the middle of nowhere. I was able to catch two shiny Pikachus which wasn’t too shabby. It’s worth noting that I’m seeing a ton of Tauros around after not having seen them at all in about six months. My theory is that they may be rotating Gen 1 Pokémon soon. I have nothing to back this up but that’s what I’m going with. 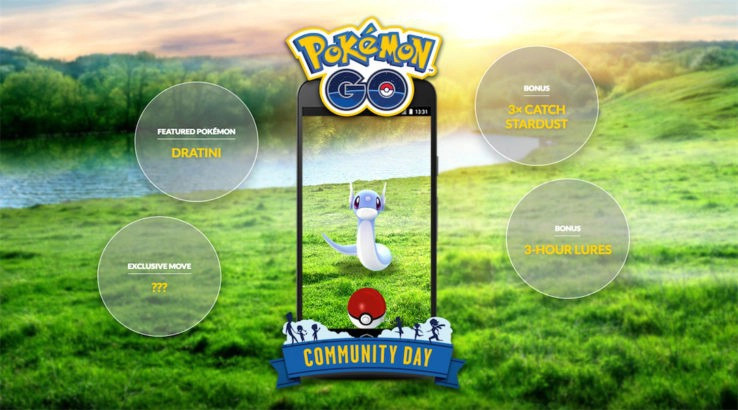 The February event, announced today, will feature Dratini as the special Pokémon. With a month’s notice I’m looking forward to actually participating this time around. Despite Dragonite no longer being the most sought after Pokémon in the game this should still be fun. I must admit I don’t care all that much about the special moves but to catch a ton of Dratini would always be welcome. Considering my record for Dratini caught in a single day probably stands around three I’m looking forward to bulking up on candies. 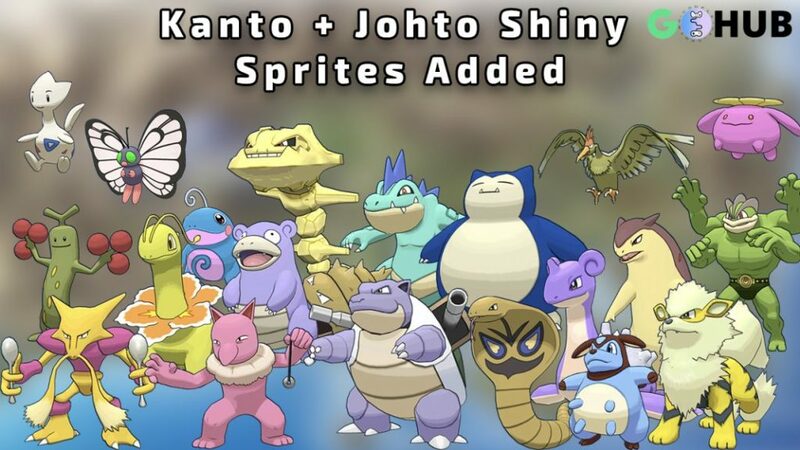 Rumors are out that this may mean shiny Dratini as well, something that would be very nice as a special release. 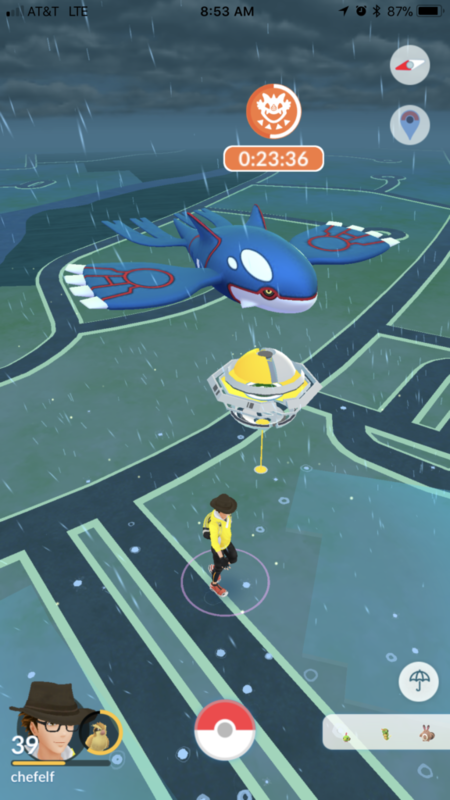 I was finally able to get out and do my first Kyogre raids this morning and things worked out very well. It was unusually warm and the forecast said rain despite not much more than a drizzle. This lead me to catching two weather-boosted Kyogre, matching the number of Groudon I caught during the incredible harsh weather we had here the month it was out. 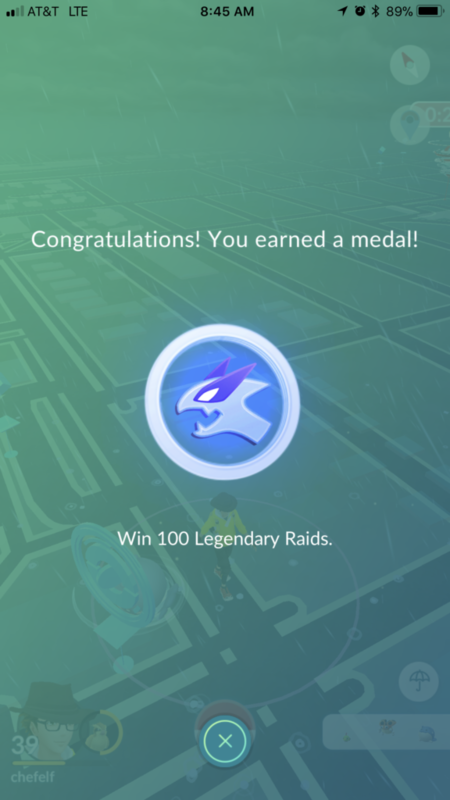 This also took me up to 100 Legendary Raids. The new update has some great features. The best feature is fixing the bug where you scroll to the top of your Pokémon screen any time you do anything. 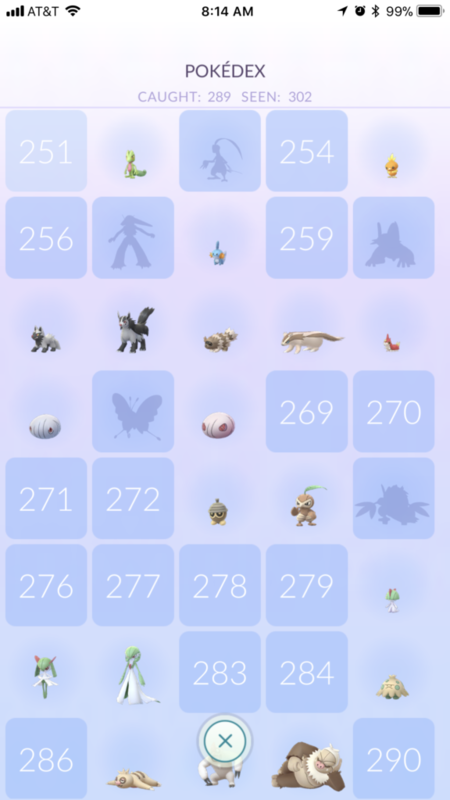 Additional features include sorting the Pokédex by region and finally grouping the incubators together. 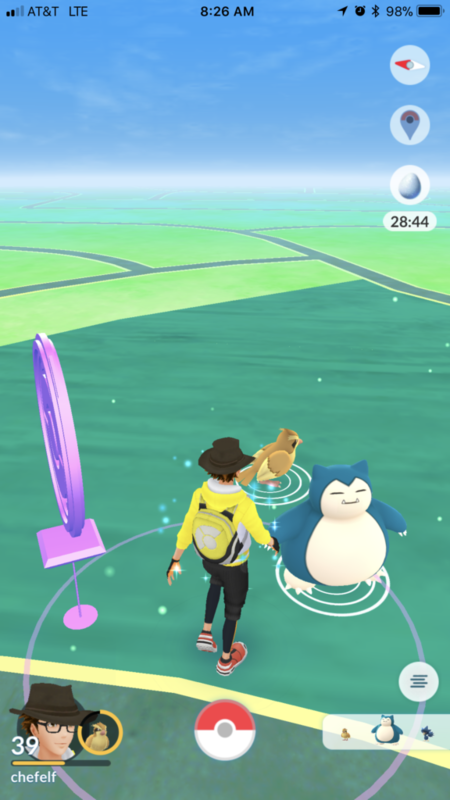 One odd change is the size of Pokémon. For some reason Pidgey now is about half the size of Snorlax. They listed this as an improvement to the way Pokémon scale. This seems much more like a bug to me. 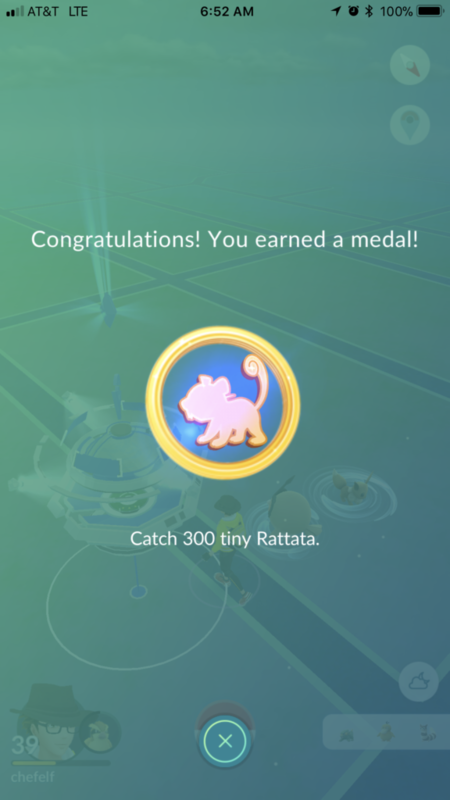 But nothing makes me prouder than finally completing my 300 Tiny Rattata Medal. 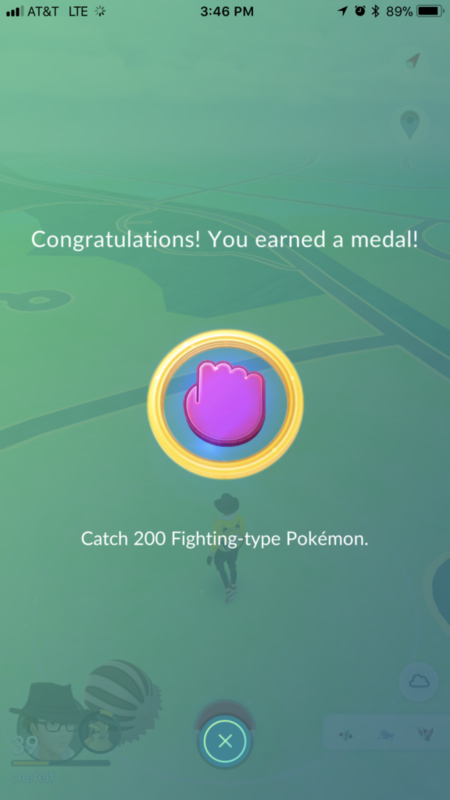 The reward for this medal is that I can resume ignoring Rattata again and I’ve got to say it feels pretty good. 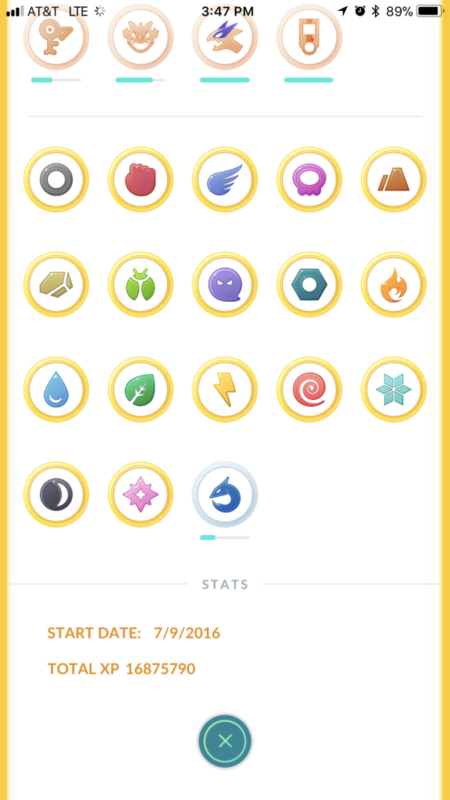 I’m 2.5 million XP away from Level 40 and I’m looking forward to ignoring a lot of Pokémon after I hit that milestone. I’m looking at you, Weedle! 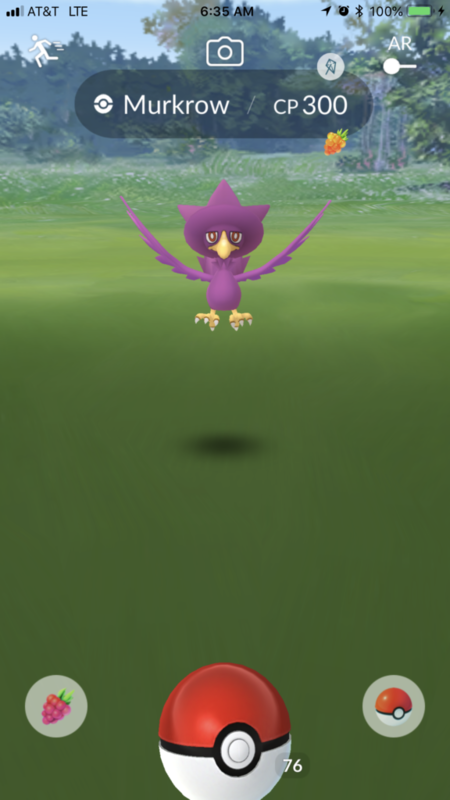 Generation 3 is upon us in Pokémon Go. Well, at least one third of it is. I’ve been saying for some time that the launch of a new generation of Pokémon is exciting but that excitement will be shortlived. After the first weekend of playing through the game I am already sick of Zigzagoon and Gulpin, however, there are plenty more of the new generation that I haven’t caught. The excitement of registering a new Pokémon to the Pokédex is always exciting. In the 90’s when the card game was huge I was always more interested in collecting all the Pokémon. Once you catch ’em all, there needs to be something to keep you playing. In the case of Pokémon Go it is certainly a lot more affordable than the hundreds of dollars I spent on those damn cards. Weather, on the other hand, is a new game play element. This is the sort of thing the game has desperately needed for a while. The introduction of weather is so much more than I originally thought. It’s not just a cool effect thrown on top of what’s already there. 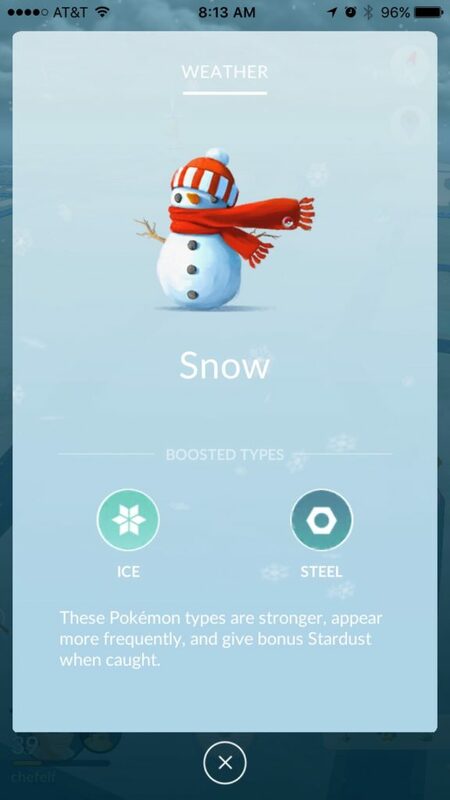 The introduction of weather influences spawns of certain types, it makes them stronger, it improves their IVs, and it strengthens their attacks. 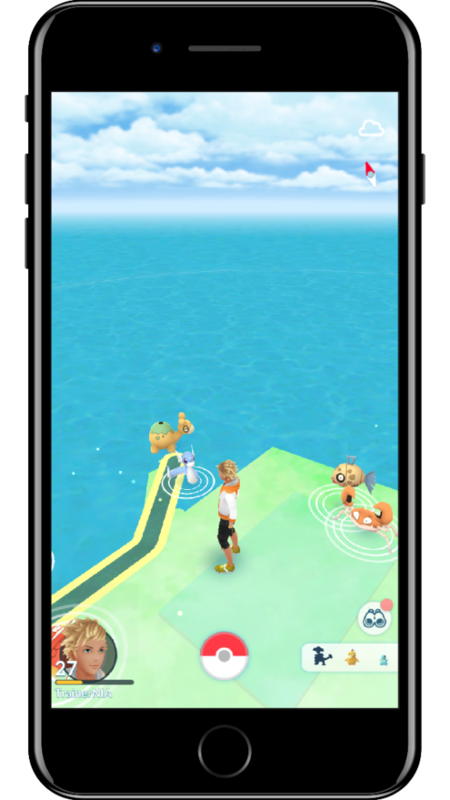 Raiding in weather is even better as you have the opportunity to catch higher level Pokémon (up to level 25) and deal more damage in those battles depending on what Pokémon you select. 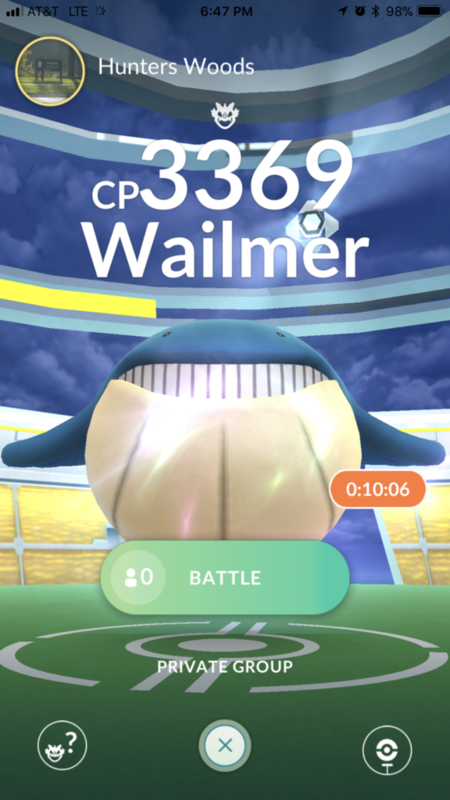 There is now more strategy in raiding and gym battling. Sometimes the strategy is just cursing up at the few clouds in the sky so that you have a chance to catch a level 25 Ho-oh. 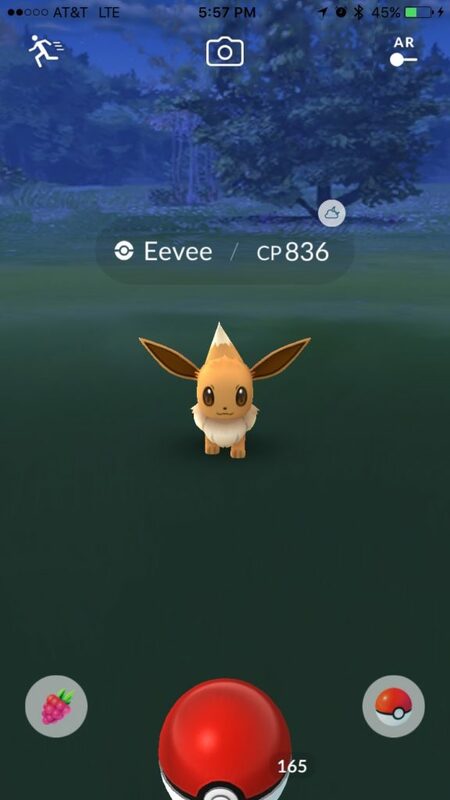 I didn’t know about the weather boost at first so when I came upon a 836 CP Eevee in the wild I was shocked. I thought maybe they’d done a CP rebalance again as the max CP for a level 30 Eevee is 830 CP. I’ve never encountered one beyond 800 CP in the past. Now I’ve caught several even higher than this one. The max level for wild spawns is now level 35, something that makes the weather effects that much more interesting. 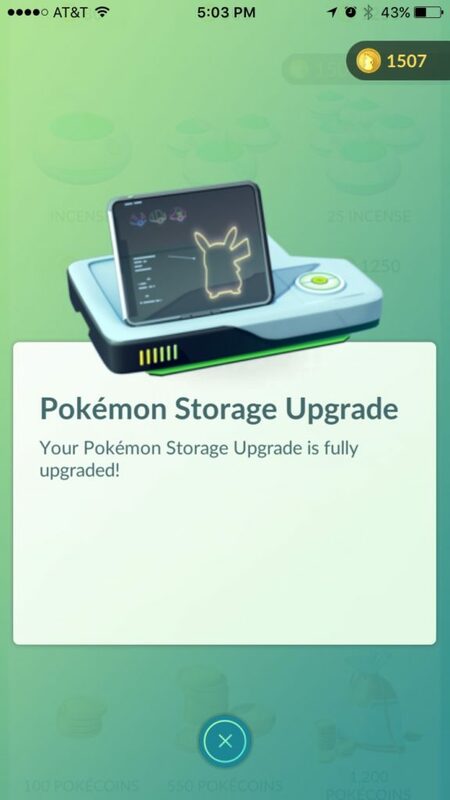 Increased Pokémon storage is another great feature. It seems crazy but my storage was constantly filling up with only (only?) 1000 slots. With 1500 I can now bank a heck of a lot more Pidgeys for the next double XP evnet. 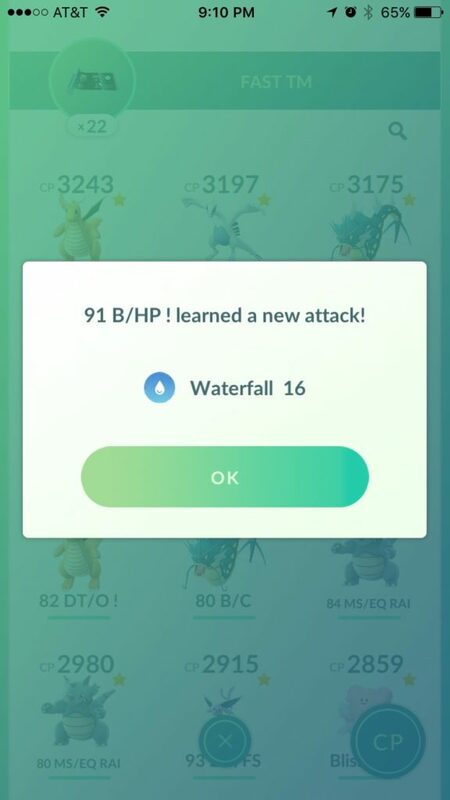 Adding Waterfall as a quick move has just made Gyarados the strongest water type attacker in the game as it should be. Eevee, at least where I play, are extremely common and having a dozen overpowered Vaporeon is relatively easy. With the 400 candy needed to evolved a Gyarados it only makes sense that it is more useful in the gym and raiding systems. 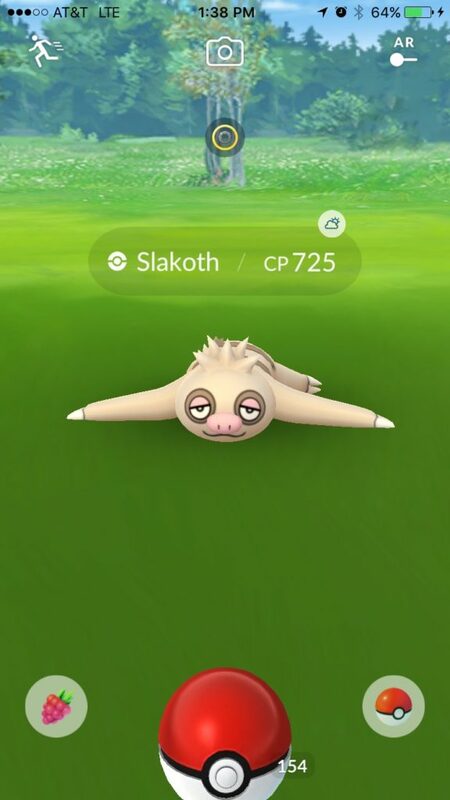 The introduction of Slakoth (evolving eventually into Slaking) makes for a fun hunt. It took me forever to accumulate enough Dratini to evolve Dragonite or enough Mareep to evolve Ampharos. It’s nice to have something challenging to work toward. The bonus is that this time it will be a Pokémon which could be extremely important, if not just fun, to use in gym battle and defense. Overall this new update has been a breath of fresh air. It’s great to get out there, find new Pokémon, and see this game take an interesting strategic turn. Ultimately releasing all seven generations would be fun but it would be short lived. What this game needs is more little tweaks like the one we just witnessed. More stats, more strategy, and more nuance in the game play. 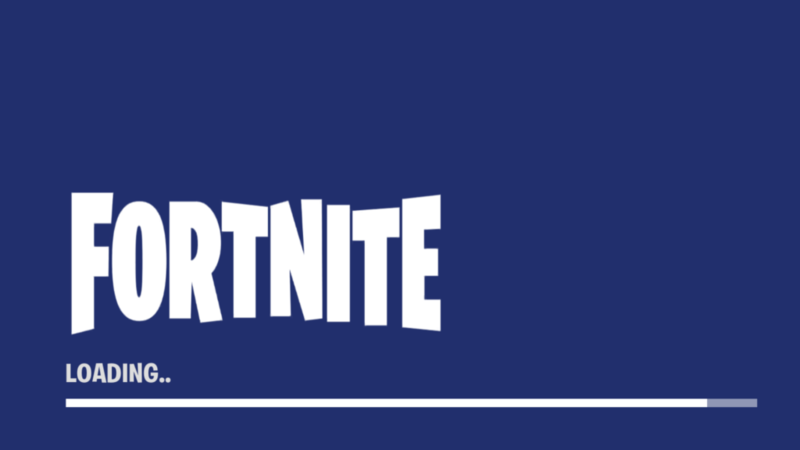 I’m very excited for what this new update has brought. 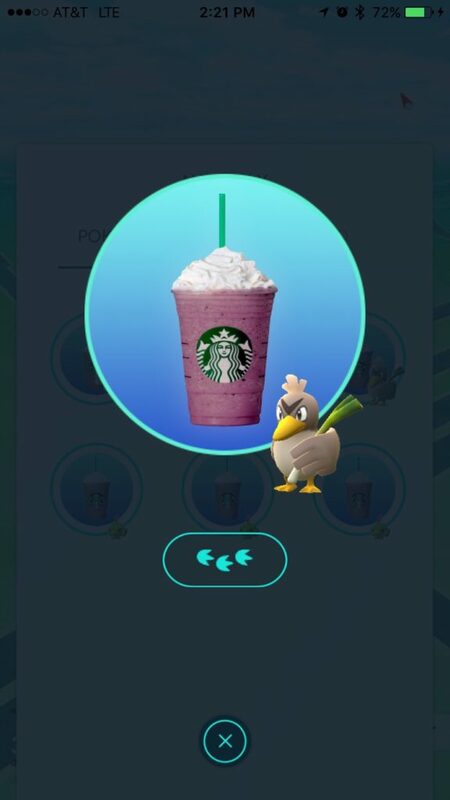 This is the biggest rework to the game since the new gym system and raids were introduced. 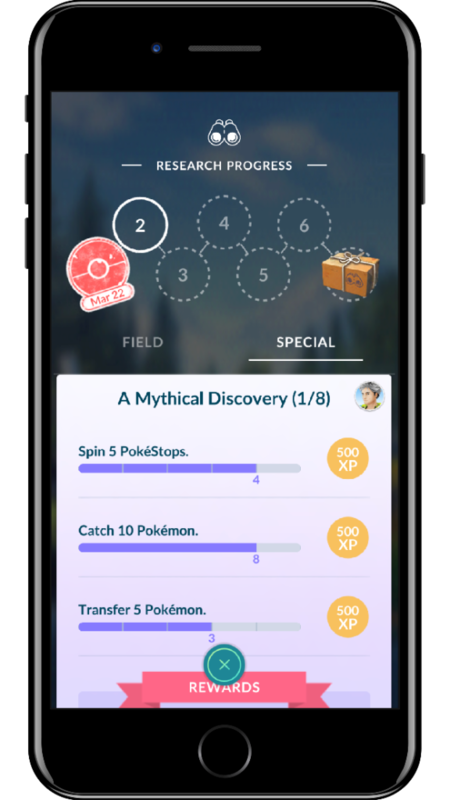 I hope Niantic does not sit back for too long before rolling out nice new features like these again. The game has taken a great step forward with depth but there is still more work needed to increase the overall percentage of time I, and many others, spend playing this game. Well, we did it. As a global community, around this time last night, we successfully caught 3 billion Pokémon. There was really no doubt that this would happen. but it was still fun. 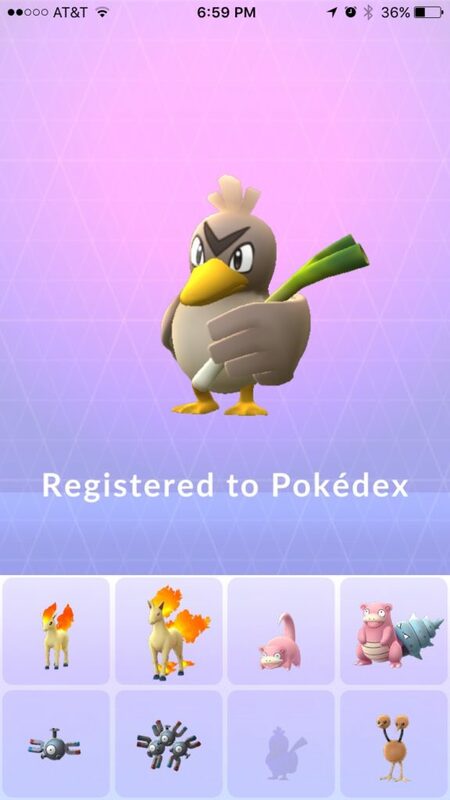 With that milestone we saw the release of Farfetch’d, previously only available in Asia. In reviewing the reward tiers this was pretty much the least exciting. Double XP and 6 hour lures was a nice incentive. Double stardust was probably the most enticing reward as stardust remains one of the most difficult things in the game to obtain. Getting access to Farfetch’d gives me mixed emotions. Part of me feels like the region exclusives should stay locked in their regions. 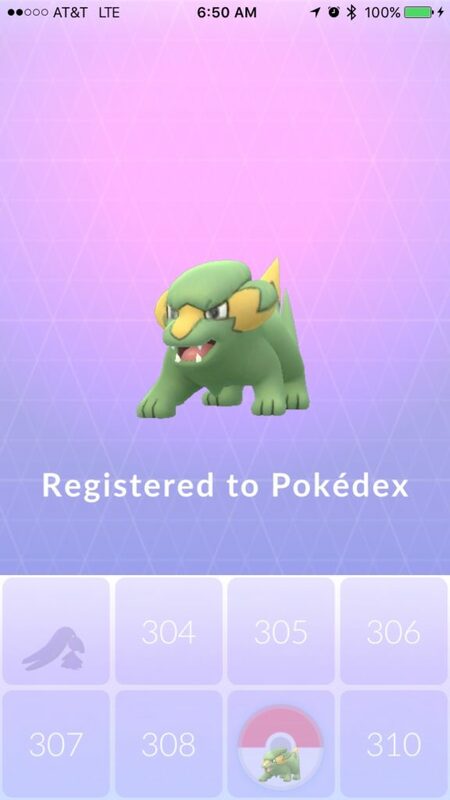 The excitement of catching a brand new Pokémon and seeing it registered to your Pokédex is one of the most powerful things in this game. However, as the final reward for this event it was a little anticlimactic. As with any of the region exclusives once you catch one that’s pretty much it. There are too many Pokémon in this game that are completely useless. Farfetch’d, along with all the other region exclusives, is one them. It’s no good for battling and no good for attacking, it’s simply a Pokédex filler. Once you catch one, you don’t really need any more. While it was nice to catch I hit the streets, put on a lucky egg, and tried to do as many raids as possible. 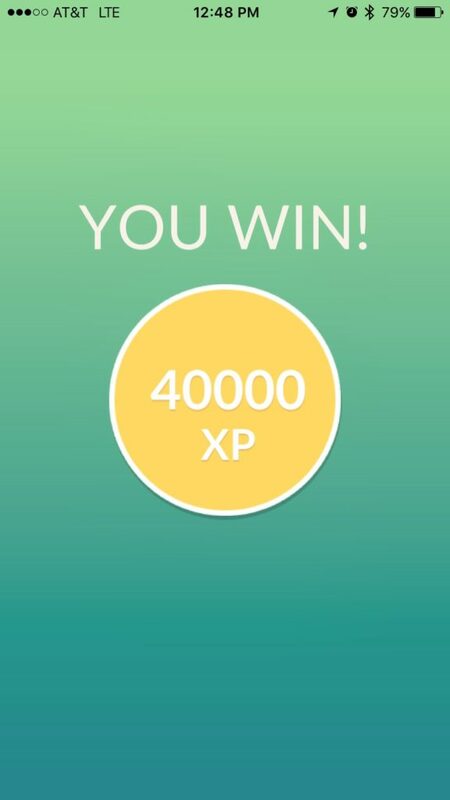 Tier 5 raids dish out a whopping 40,000 XP during this event with a lucky egg on and after catching Farfetch’d I was eager to try to collect as much XP as possible before the event concludes. 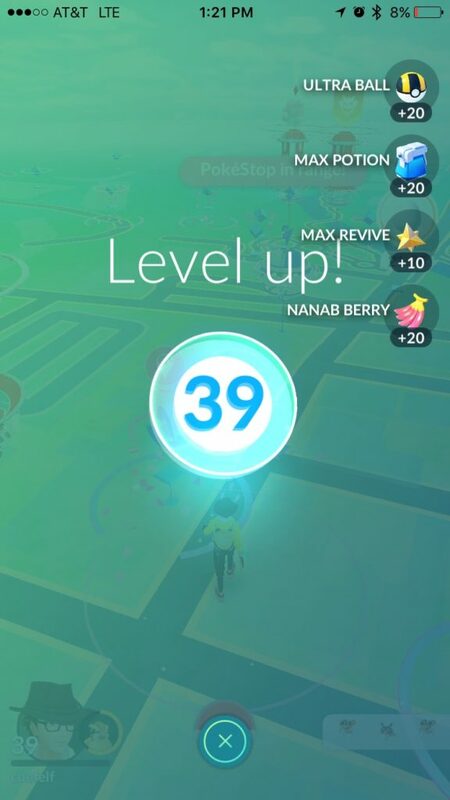 This afternoon I finally hit level 39. That means I’m 75% of the way through the game. Now begins the length 5 million XP slog to level 40. Short of double XP events it’s going to be some pretty slow progress from here on out. Overall I think this event has been a little different and pretty fun. However, what it proves is that he addition of new Pokémon only introduce a very brief excitement back into the game. There are some fundamental changes and additions that need to be made if they are going to capture the same level of enthusiasm that the game once enjoyed. Until then I’ll continue to play every day, slowly making my way to 40. I haven’t missed a day since the game came out. The difference is between those days where I play for a total of 20 minutes, and the days where I am walking 20 kilometers and end up playing for 10 hours or more. Let’s hope I’m still level 39 when the next round of excitement begins! 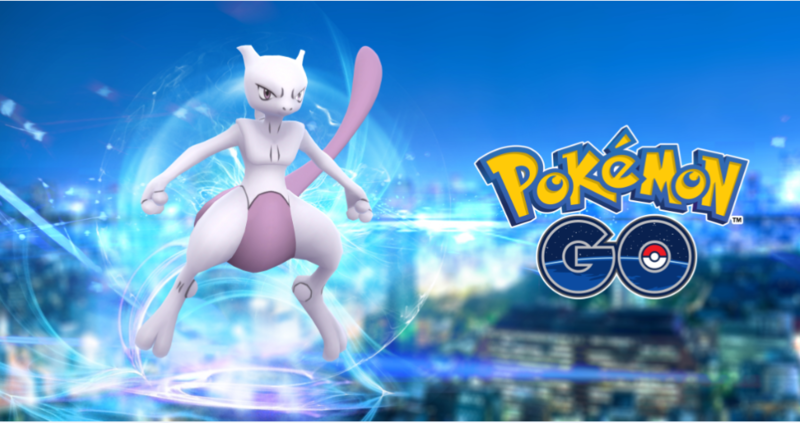 Yesterday Niantic announced some clear changes and explanations surrounding the EX Raid system in Pokémon GO as well as changes to the regular raid system. You can see the official announcement here. 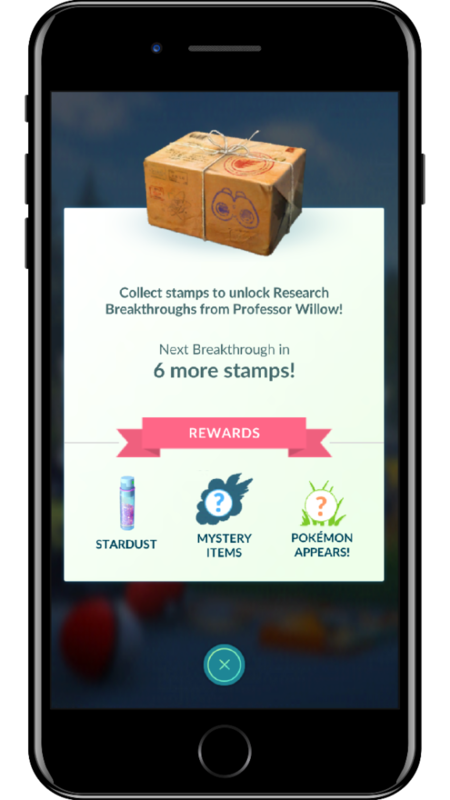 This shouldn’t be a big deal, however, Niantic is constantly extremely vague with information surrounding every aspect of the game. While I would still prefer that the EX Raid system goes away it is encouraging to have some sort of insight as to how it actually works. They are responding to a very common complaint with the game and one can only hope that they listen to the other valid complaints that many of us have. 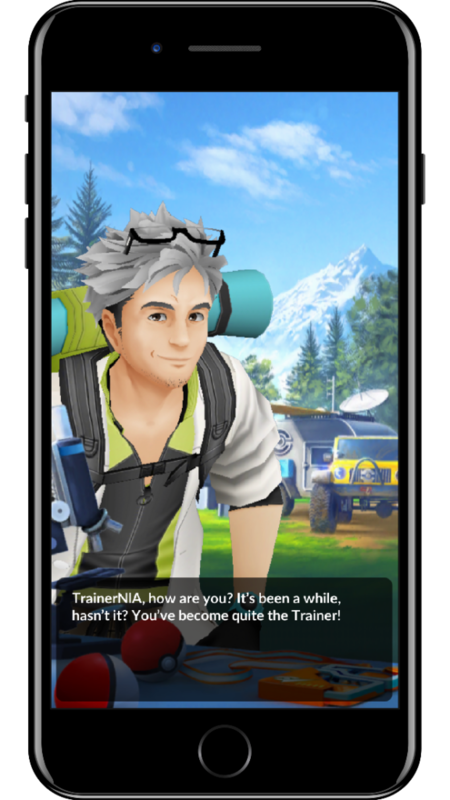 One can hope that this is the beginning of what will be much more clear communication from Niantic about updates and changes being made to the game. 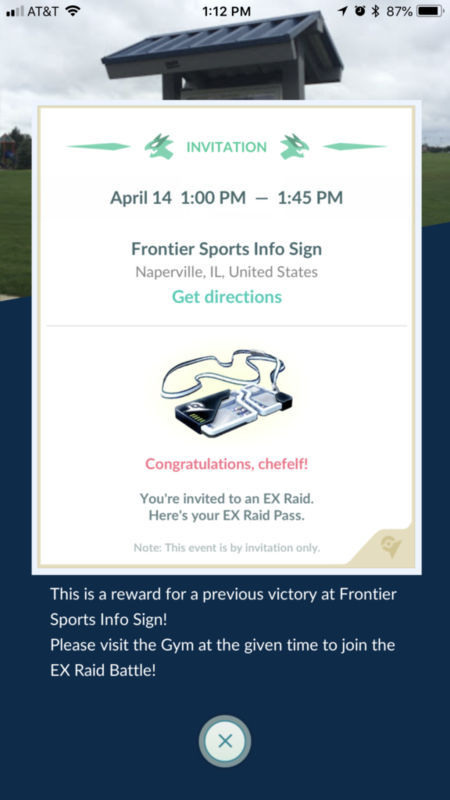 The real test will be seeing if having access to this information improves anyone’s chances of actually getting the elusive EX Raid pass. It would be nice to get my hands on a Mewtwo before they do some sort of mass release and we start catching it with Santa hats in another month. Pokémon GO players have eagerly been awaiting the announcement of a Thanksgiving event. 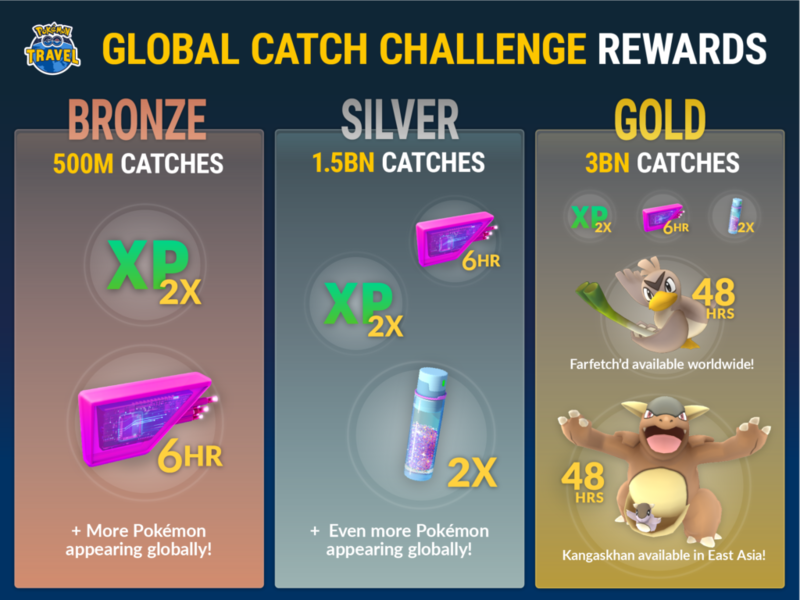 Earlier today Niantic announced the Pokémon GO Travel and the Global Catch Challenge. 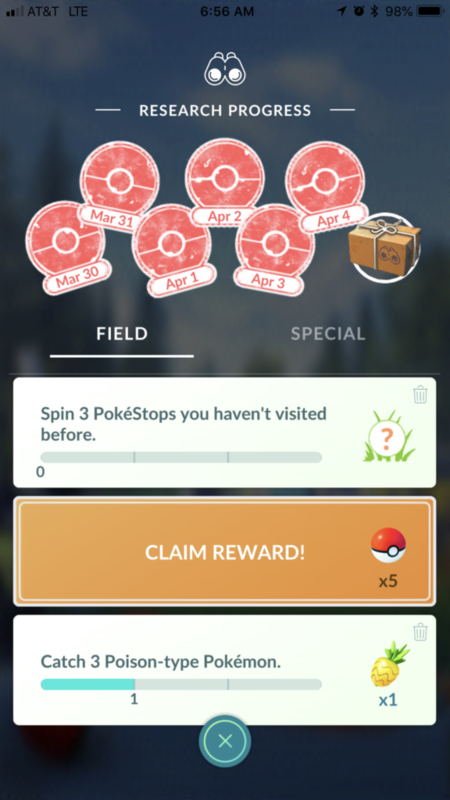 In true Niantic fashion they’re a little short on details such as the actual start date and time or giving us a ballpark of how hard it will be to catch 3 billion Pokémon. I don’t have any sense for how many are caught in an average week and I’m sure most players also do not have access to that information. Nevertheless it looks to offer some potentially interesting rewards. I don’t know what the likelihood of all of us hitting the 3 billion mark is but I suspect that no matter what it will happen. I can’t imagine anything that would take the wind out of our nearly windless sails more than the potential for unlocking a regional exclusive and then not delivering. Catching my first Farfetch’d would be pretty cool but the double XP and double stardust is even more appealing as I lumber slowly toward level 40. 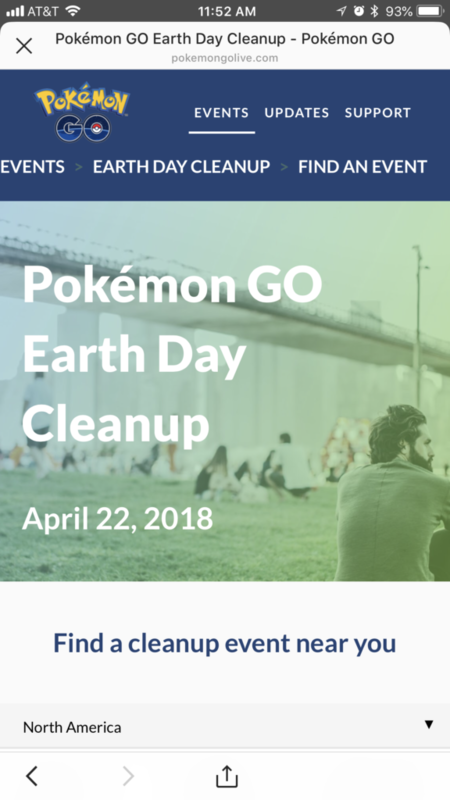 This could keep the game interesting for another week or two but Niantic still has a lot of work to do to make this game at all compelling for most of us who play daily. For now I’ll just enjoy these small windows of fun and hope for the eventual update that will rekindle the game for us all.